He called his shot, and he got it done. 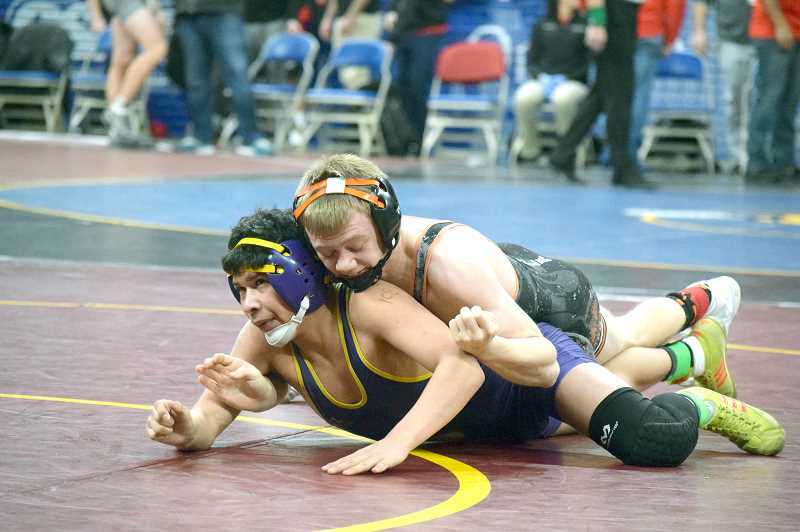 126-pounder Max Tate said before the district meet that he was going to be a state champion and as the tournament wound down, he reached the gold. Tate's run to the top was flawless. The talented junior picked up a technical fall 17-0 at the 3:51 mark of the match with La Grande's Cole Isaacson in the opening round. In the quarterfinals, it was just as dominant but expedited, as Tate pinned Ontario's Trey Trejo in just 33 seconds. The semifinals saw Tate go the distance for the first time in the tournament, winning a 7-3 decision over Sweet Home's Robert Watkins. In the finals Tate once again went the distance, this time winning an 8-1 decision over La Grande's Braden Carson. The win brought a gold medal back to Molalla High School, and validated the rebuilding process the wrestling program has undergone. Another wrestler who made it to the podium was senior Dustin Asher, who took fourth place in the 106-pound division. Asher got the ball rolling with a first round pin of Ontario's Froylan Santiago, and then winning a hard fought 13-7 decision over Sweet Home's Kyle Watkins. The semifinals saw Asher pinned by Junction City's Cameron Truesdell via pinfall. In the consolation semifinals, Asher decisioned Sweet Home's Treyson Smith 8-1 to make it to the third place matchup. Ultimately the bronze wasn't meant to be as Baker/Powder Valley's Isael Duran got the pin on Asher at the 2-minute mark. At 160 pounds, Emmett Smyth landed in sixth place with a 3-3 run. Smyth started strong with an 11-3 major decision, but wound up on the wrong side of another major decision in the quarterfinals against Phoenix's Elijah Santana. In the consolation bracket, Smyth rebounded strong with a pin over Banks's Johnathan Dudley at the 2:43 mark. In the third consolation round, Smyth pinned Baker/Powder Valley's Gauge Bloomer at 4:26 of the match. A pair of defeats to Tillamook's Miquel Niemi and Alex Werner saw the run come to an end. In the 170-pound weight class, Molalla's Hunter Beck went 1-2 at the state tournament. Initially defeating Ontario's Austin George, Beck was downed by Elmira's Nat Brown and Phoenix's Dane Johnson in subsequent outings. At 132 pounds, Molalla's Christian Roberts was pinned in a pair of outings against Ontario's Ruben Hernandez and Stayton's Tanner Goodman. 182-pounder Bo Edwards suffered a similar fate, losing to Hidden Valley's Julian Grinager and Estacada's Dylan Adcock in less than a round each. 170-pounder Celab Taylor was downed in a pair of outings against Elmira's Nat Brown and Siuslaw's Riley Jennings.